Nearly every day we’re asked the question: Do I need a lawyer after my car accident? When do I need a car accident lawyer? After any accident, you should get a free case evaluation from a qualified attorney. Most reputable accident lawyers will evaluate your case free of charge, and without any obligation. If your accident resulted in substantial injuries that have had a significant impact on your life, it’s especially essential to contact an attorney. By engaging with a qualified attorney you give yourself the best possible chance to receive maximum compensation. Keep reading for the longer answer. Call Sutliff & Stout at (713) 987-7111 or complete the short form below to find out for sure. Whether you need to get a lawyer after a car accident depends on the severity of the accident and the injuries caused by it. If you got in a fender bender or a minor car accident and nobody was hurt, you probably don’t need to hire an attorney. Typically, the damage from minor car accidents can be resolved through the insurance companies of the drivers involved. Similarly, most Texas traffic tickets and violations can be resolved through the municipal courts without a lawyer. But if you were involved in a more serious car accident, you may need to hire an experienced car accident lawyer to help protect your interests and ensure you get the compensation you deserve. After a major car accident, an attorney can help you recover money for any damage to your car and personal belongings, secure funds for past and future medical treatment, and collect evidence to show that you were not at fault in the accident. An attorney can also communicate on your behalf with insurance company representatives, the other driver’s lawyer, and the courts. A serious car accident can be debilitating and disorienting. Hiring an attorney to advocate for you will allow you to focus on what’s most important after a serious accident—recovering from your injuries. If you were hurt in a car accident, here are some signs that you need a lawyer. If anyone was seriously injured or killed in the car accident, contact an experienced accident lawyer right away. Accidents involving serious bodily injury or death can result in a complicated lawsuit (or multiple lawsuits). You may need to file a personal injury lawsuit against the at-fault driver to recoup the cost of the medical treatment for your injuries. You could also face a personal injury or wrongful death counterclaim. The court will have to consider multiple legal issues, and the amount of potential damages could be very high. You should never represent yourself in a lawsuit filed after a serious car accident. These types of civil legal cases involve complex issues that require expert advice. Your car accident attorney can help calculate the amount of compensation you deserve, guide you through the legal process, and represent you against any possible counterclaims. Most reputable lawyers with experience handling personal injury or wrongful death cases will offer a confidential and free legal consultation, so there is no risk in scheduling a case review with a car accident lawyer. If you were hurt so badly that you can’t return to work after a car accident, a lawyer can make sure that you maximize the compensation you receive. Some people are injured so severely in car accidents that their earning capacity is impacted for life. An experienced personal injury lawyer will know how to calculate the amount of compensation to which you’re entitled under Texas law. This compensation will take into account any missed work and the cost of medical treatment you need now or in the future. If you were in an accident involving three or more vehicles, this can complicate the insurance claim settlement and negotiation process and lead to multiple lawsuits. Some accidents involve other parties such as pedestrians, property owners, or commercial entities. For example, the driver of a commercial delivery truck may fail to stop at a red light and enter an intersection illegally. A driver of a passenger vehicle may swerve to avoid the delivery truck in the intersection and hit a motorcycle in the neighboring lane. This type of multi-vehicle accident would likely result in a complicated lawsuit or even multiple lawsuits. If you were hurt in a car accident and more than one other party is involved, contact a lawyer to talk about the case. A car accident lawyer will fight to get you the compensation you deserve and keep your liability to the other parties as low as possible. An attorney can also help communicate with the lawyers for the other parties and their insurance companies. If one or more of the parties involved did not have insurance at the time of the car accident, you should search for a car accident attorney right away. Texas law requires people who drive in the state to pay for the accidents they cause. Although most drivers are responsible and carry insurance that complies with the financial responsibility law in Texas, some people drive without insurance. Unless specifically rejected, auto insurance policies in Texas include uninsured motorist coverage, but this might not be enough to cover the cost of your damages and treating your injuries. An experienced lawyer can help you evaluate your options and, if appropriate, file a civil lawsuit for money damages against the uninsured party. If you were hurt in a car accident, you may need a lawyer to help you collect and analyze evidence that establishes who was at fault and what your injuries are worth. For example, most newer vehicles are equipped with a piece of recording technology known as a “black box” that records critical information during a car accident. This information may establish how fast the car was going at the time the accident occurred, or whether the driver was wearing a seatbelt. In order to access the other driver’s data recorder, you may need a court order for this type of data, and a lawyer can help you request one as part of a lawsuit. Most car accident lawsuits settle before going to trial, which means that you’ll probably receive a settlement offer from the at-fault driver or his or her insurance company. Usually, an unreasonably low settlement offer. Settling a lawsuit before trial can save a person money, but you should only settle if the amount offered is fair based on your injuries and damages. Settlements require you to give up certain rights and, thus, you must understand your rights and the extent of your injuries and damages before engaging in settlement negotiations. In most instances, an experienced car accident lawyer can negotiate a higher settlement than you can on your own. You should hire a car accident lawyer who has experience negotiating favorable settlement agreements for clients. Don’t be afraid to ask your lawyer to about past results. In Texas, you are required to file a lawsuit after an accident before a deadline known as the statute of limitations has passed (typically two years from the date of the accident). If a lot of time has passed since your accident, you should talk to a car accident lawyer right away to make sure you haven’t missed this deadline. A lawyer can ensure that you comply with all procedural requirements related to your case and don’t miss any critical deadlines. If you are coming up on your deadline, you cannot assume the insurance company will be fair with you. We have heard from a lot of individuals who thought the insurance company was going to pay, but really they were just waiting for the deadline to run so they could deny the claim. 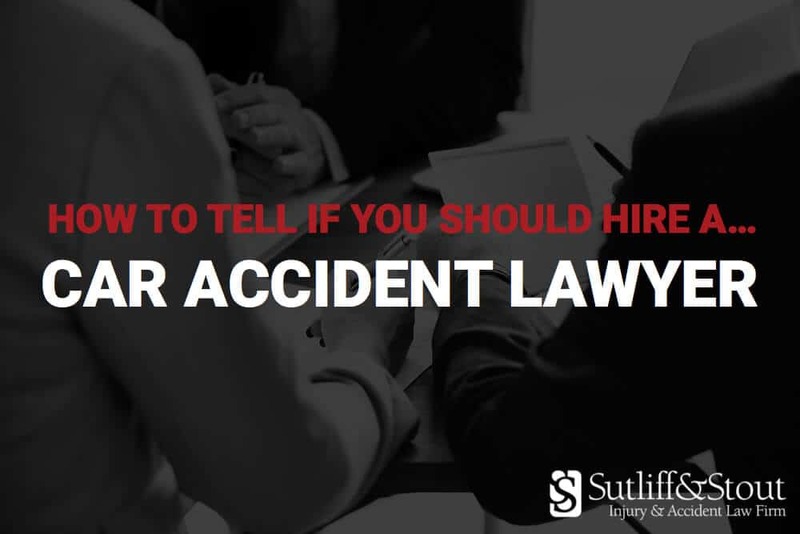 “Should I get a lawyer after a car accident?” If you want to talk to a car accident lawyer about your case, Sutliff & Stout can help you determine whether you need a lawyer. Sutliff & Stout represent clients who were seriously injured in car, motorcycle, and truck accidents. For a free and confidential consultation about your case, text or call (281) 853-8446 anytime, 24/7.